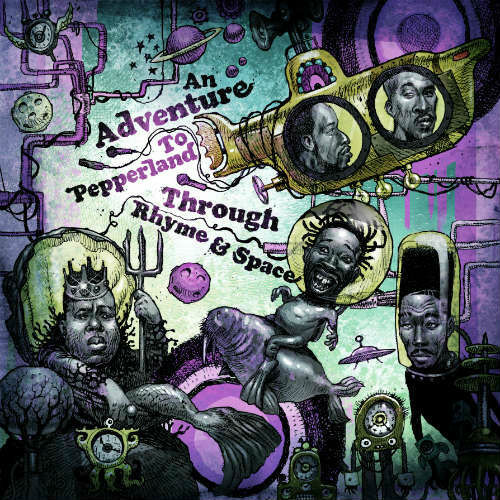 THE BEATLES VS. HIP-HOP LEGENDS: ‘An Adventure To Pepperland Through Rhyme & Space’ (2015) Free download double album exclusive! Rating: Some will be aware that today is the fifty-first anniversary of a musical singularity, for it was February 7, 1964 when The Beatles once boarded Pan Am Flight 101 to New York. However, as you’re about to find out, today itself is also a musical singularity. Why? Let’s just say it had to do with a certain J. Lennon Esq.’s insistence that the band’s Boeing 707 fly over the Bermuda Triangle. Which means you’re about to get your hands on An Adventure To Pepperland Through Rhyme & Space – the epic 48-track double LP download documenting the consequences of an unscheduled detour through a rift in the space-time continuum by the Fab Four…to 1990s Brooklyn. Having landed in hip-hop’s golden era, it seems the band set up and jammed in a makeshift studio with assorted rap legends. Which is when things got really trippy. And ill. In fact ill-trippy. Although, clearly, the Fab Four eventually got a ticket to ride back to ’64, the music forged in that time-out-of-time was thought to have been lost. Until now. This album reveals the band journeyed through the doors of perception much earlier than previously thought and worked with everyone from P.E. to Spoonie Gee, Tha Liks to Hieroglyphics and Large Professor to Salt n Pepa. Among others. Frankly, it’s a helter skelter ride from ‘mop-top hip-hop’ to ‘let it beats’ – or perhaps we should think of it as ‘blunted rappers mashed with drug-fried band’ which – after all – sounds much like an album title itself. There cannot be a single earthly reason for you not to turn on, tune in and download the music, the images, the ‘liner notes’ and the instrumentals below in assorted formats. Get on it! Original download disabled in December 2015 at request of producer in order to stimulate sales of the vinyl version. As of May 2017 – the album is once again available for download via bandcamp on a ‘name your price’ (no minimum) deal HERE. 29 Responses to THE BEATLES VS. HIP-HOP LEGENDS: ‘An Adventure To Pepperland Through Rhyme & Space’ (2015) Free download double album exclusive! Tx for sharing; great work, keep up the good vibes. Really beautiful work. Thanks for giving this to us. Many many hours of creation and inspiration, this will bring me joy every time I play it. Already recommending it to every music lover I know. The m4a version of part 2 was uploaded as lossy AAC vs. the others which are all lossless, any chance there’s a lossless version of part 2? Thanks! By the way, where are the images and ‘liner notes’ (as mentioned in the text)? I see only link to the front-art? You’re welcome, but it wasn’t the monkey who made this! What a lovely download- thanks Monkey Boxing, you are all lovely chaps for putting this up. If only we knew who put it together? How I wish I could get someone that gifted to produce my stuff one day. Ah well. – On part 1, the flac version download track 10 is only 26 secs long??? WOW. as an old guy who grew up listening to the Beatles and who enjoyed early hip-hop, this is just f’ing genius. serious respect to the person going by the nom de plume “MartinGeorge”. Much love and respect on this album. Well done and much needed in todays commercial laiden hiphop. Hiphop is going through a different era at the moment and this makes me happy knowing there are ppl out there that like and respect the origins. Totally feeling it. Can’t thank you enough. Including the instrumental versions is real class. And lossless, too. You so class you a whole school. Yes! The people behind this fine release deserve vast amounts of money, fine women, fast cars, a country mansion with a butler and a beats factory in the stables…what what. I too would love to enjoy a cup of brown joy with the wonderfully skilled humans behind this creation. Yes this is amazing. I need to know who made this?? Hey, thanks so much for updating the Part 2 m4a files to Lossless. These sounds are so wonderful. I listen to the vocal and instrumental tracks each day, no sign of that changing in the near future. Beautiful work. Hi George! Hi John! The opening remembers me a little bit at the opening-scene of the film “Contact”, from 1997. Do you remember? Just if you maybe wonder about the fact, that you’ll got some more downloads from Middle-Europe since the last days, I will tell you the story behind. THX – for all! Great work! BTW: I’m not a real “Hip-Hop” fan! But THIS is cool! Greetz 2 All around the world! Ohhh many thanks for sharing for free this fantastic album! this is one of the dopest things i’ve heard in a long, long time. ever?!! please feel free to delete this if you think it’s spam, but i just think it’s relevant. The links don’t seem to be working..? Any indeas as i’d love to get this. Thanks. P.S. Keep thank you for keeping the funk alive..! Just tried the links and they’re all working for me. Is it all the links that aren’t working for you or a particular one or ones? Please let me know which. Also – make sure you refresh your browser/ delete cookies etc. as the links that were up for the first week were later changed. I’m thinking that if your browser is still showing you an old version of that post for some weird reason, then the links might not work! P.s. If you still don’t have any luck, email me at monkeyboxing.editor@yahoo.com and I’ll sort them out via another route for you. 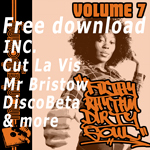 Why disable the free download and instead insist people buy the vinyl to get a FLAC copy? This shouldn’t be a footnote, this whole page needs to be rewritten to be less misleading to people. That or you just don’t care as each click is advertising revenue and that’s the only care.